EnergySolutions says safety is top priority, firm will comply with state regulations. Steve Griffin | Tribune file photo The environmental group Healthy Environment Alliance of Utah says the plan to bring downblended waste to EnergySolutions' Tooele County landfill could double the amount of radioactivity at the site. The company says safety is its No. 1 priority and it will abide by state regulations. A Utah environmental group wants Gov. 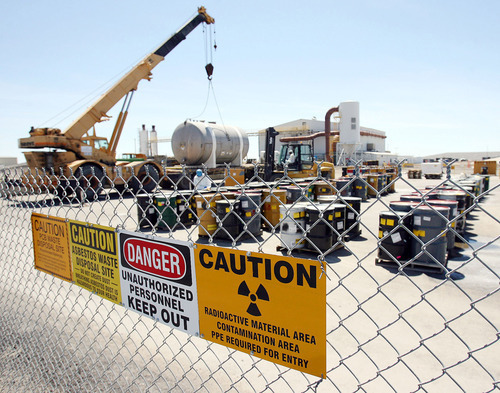 Gary Herbert to renew his objections to "downblended" radioactive waste. The Healthy Environment Alliance of Utah released new estimates Wednesday showing that downblending could double the radioactivity coming to the EnergySolutions landfill in Tooele County and possibly even quadruple it. The projections come just as the Utah Division of Radiation Control gets ready to ask the public to comment on blending. "We will call upon [the governor] to stick to his guns," said HEAL policy director Matt Pacenza, noting that Herbert has questioned blended waste in the past. "To us, this [blended waste] is a clear attempt to sneak hotter radioactive waste into Utah." State regulators have been trying to decide for months whether EnergySolutions should be required to do a more in-depth analysis on the company's "Semprasafe" process, which involves diluting more hazardous Class B and Class C waste with less hazardous Class A radioactive waste. Blending waste this way ensures that it is not too concentrated to meet state hazard limits  the state banned Class B and C waste in 2005 - and it can be buried in EnergySolutions' low-level radioactive waste landfill in Tooele County right away. A national backlog of B and C waste has been building for three years. And, while EnergySolutions has promoted downblending as a disposal solution, a new radioactive waste site is coming online in Texas next month. But Pacenza said the state radiation office decision could expose Utahns to more radiation than they want. His group used state records and industry inventories to calculate the increased radioactivity the state could expect each year if regulators approve blended waste as HEAL believes they are poised to do. HEAL found that waste EnergySolutions buried in 2010 contained 7,450 curies of radiation, and that blended waste would mean an additional 19,184 to 28,470 curies each year. "It's a bunch more radioactivity and radioactivity is dangerous," Pacenza said. "It's a game-changer." Company spokesman Mark Walker insisted that, blended or not, any waste coming to the Utah site will meet the hazard limits in the company license and in state law. "We will manage this material like we manage all material that is disposed of at Clive," in Tooele County, he said, adding that safety is the top priority. HEAL is scheduled to meet Thursday with Herbert's counsel, John Pearce. "The governor has repeatedly stated his opposition to any waste that exceeds the level for which Utah is permitted," said spokeswoman Ally Isom, "as his primary concern is for the health, safety and welfare of the people of Utah." Meanwhile, the state's radiation control board has yet to weigh in on the issue. Peter Jenkins, a health physicist and chairman of the board, noted that more radioactivity does not automatically mean a corresponding increase in hazard to the public. He said EnergySolutions will be required to stay within its Class A hazard limits. "Right now," Jenkins said, "they are far below their dose limits."